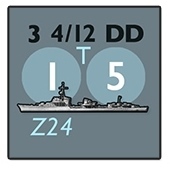 Arctic Disaster features individual counters for every ship and submarine, while the Luftwaffe is represented by 9-12 aircraft groups. Surface to air combat, surface combat, and anti-submarine combat is modelled with a clean system steering the players clear of an elaborate combat resolution process - permitting quick play and multiple game iterations. Detection is also handled in a manner so as not to overwhelm other game functions.